For reservations in the Plains states, poverty is the norm. The Pine Ridge and Rosebud Reservations in South Dakota remain among the poorest counties in the U.S. These reservations have few natural resources and no major industry. Housing is seriously overcrowded. For Pine Ridge, the average family income is reportedly $3,700 a year, higher in some communities but always a breath away from poverty. For Rosebud, unemployment hovers around 82%. For Northern Cheyenne, some 35% of the people are said to have experienced persistent hunger. The shocking truth is that — in the heartland of the United States — thousands of American citizens live in Third World conditions. Native American Aid (NAA) brings hope to these struggling Indian families. These are Native Americans revered for their culture, yet many of their basic needs go unmet. NAA programming gives these proud people a way to create positive changes in their communities. Local tribal members volunteer to help plan and distribute NAA goods and services in their communities. The volunteers, in turn, receive much-needed items such as toiletries, baby food, and clothing — an acknowledgement for giving their time on behalf of their communities. Special reservation volunteers, also known as Program Partners, identify the most pressing needs in their communities. Their input ensures that NAA services address genuine shortages and make a real difference for the people being served. of soap can be unavailable. NAA services make good use of donated supplies from concerned organizations, and good use of funds from concerned individuals like you. The goods most typically requested are basic necessities such as shampoo, soap, lotion, cleaning supplies, laundry detergent, healthy foods, diapers, underclothes, socks, and blankets. Provides clothing and items that comfort children living in foster care or group homes. 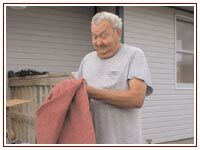 Provides the help necessary to alleviate adverse hardship on Native American families impacted by a natural disaster. 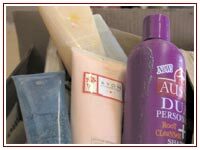 Helps meet the basic needs of impoverished seniors through bulk and remote distributions, with products such as soap, toothpaste, detergent, and blankets. Provides emergency food boxes to Elders who might get snowed in during the winter, and ensures that reservation pantries have food in stock. All in all, NAA programming lets thousands of Native American families on remote and economically-depressed reservations know they are remembered.